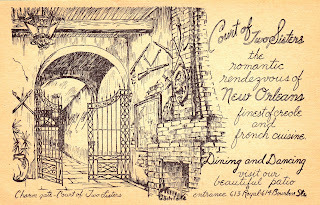 Outgoing postcard US-3891824 to France shows the Court of Two Sisters at 613 Royal Street and 614 Bourbon in the heart of the Historic Center of old New Orleans. The name was gained from the fact that two sisters conducted a fancy and variety store here. The present structure was erected in 1832 on the site of the residence of Sieur Etienne de Perier, the second royal governor of the French Colonial Louisiana. Currently, it serves daily jazz brunches with a buffet of Creole classics as well as à la carte dinner. 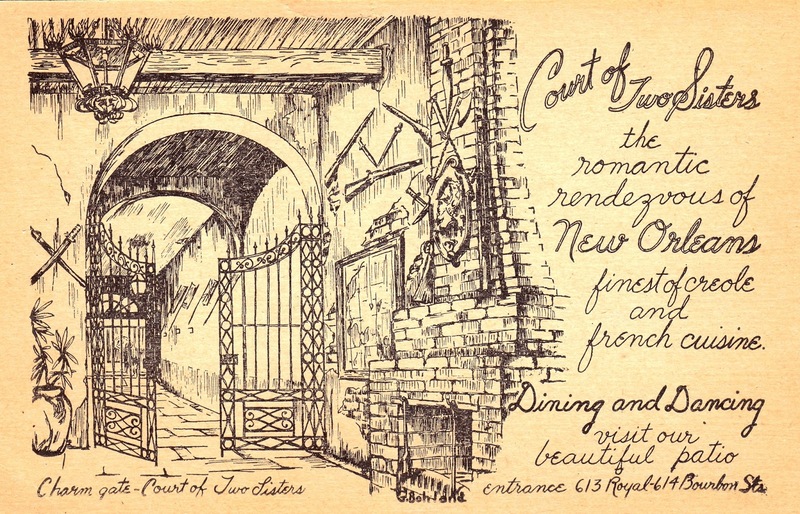 Jimmie Cooper, the owner between 1940 and 1956, used this card to offer "greetings from as romantic a place as you ever ate in - drank in - wrote home about." It reads on the back of the card: It's been here a long time, since way back, and the "Two-Sisters" have long been gone - but the famous "Court" remains more charming and beautiful than ever. One of the nicest things about the place is - "There's always a table especially for you." Jimmie guided the Court to reach the great popularity among the servicemen and women from all over the world when New Orleans was a major shipbuilding and embarkation center. The charm gates seen on the card were wrought in Spain especially for the Court of Two Sisters.